Made in the USA, Seaman Shelter-Rite leads the industry in modern materials and methods, producing high performance architectural fabrics for over 40 years. Need assistance with the next steps of your project? We're here to help. Let us know! The Shelter-Rite product line consists of Types I-V 100% polyester, weft-inserted, warp-knit fabric structures. For interaction with and protection from the elements, a variety of top finishes are available to meet aesthetic, color, durability, and translucency requirements. Learn the key differences between structures that are built using architectural fabrics versus those built with traditional brick and mortar. 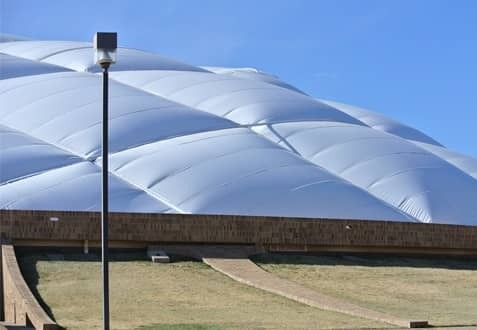 Seaman Shelter-Rite fabrics, offered with a Tedlar® top finish, are used globally for year-round, climate-controlled, multi-use sports or industrial facilities. 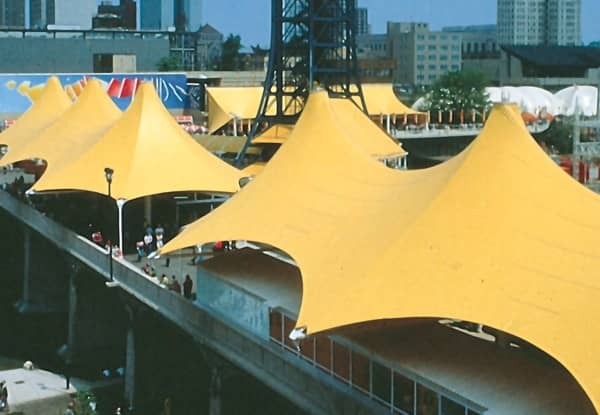 Landmark coated fabric structures often involve custom designed, three-dimensional shapes. These high profile structures typically utilize a fluoropolymer top-coating system. Frame structures consist of an internal metal frame and an architectural fabric skin stretched over the frame. The skin is available to meet a variety of structural designs and colors. If you'd like to receive a Shelter-Rite sample or discuss your project, please let us know. The Sun Park Tennis Club indoor facility was constructed using a pressurized air structure made from a reinforced architectural fabric. Air quality concerns lead the owner to choose a self-cleaning, high end architectural fabric manufactured by Seaman Corporation. This fabric has a heavy polyester base fabric coated with a UV stable coating, top finished with a Fluoropolymer film allowing for self-cleaning when it rains. The film is the key to both cleanability and longevity, while the rugged base fabric and coating provide the strength and mechanical properties necessary for building design. Needing to expand its facilities, NorthStar Church in Knoxville, Tennessee chose to build an architectural frame structure. NorthStar selected Shelter Rite fabric by Seaman Corporation for its favorable construction value, low maintenance requirements, longevity and positive aesthetic appeal. The fluoropolymer top finish also provides maximum life, minimum maintenance and sets the industry standard for long-term color retention. 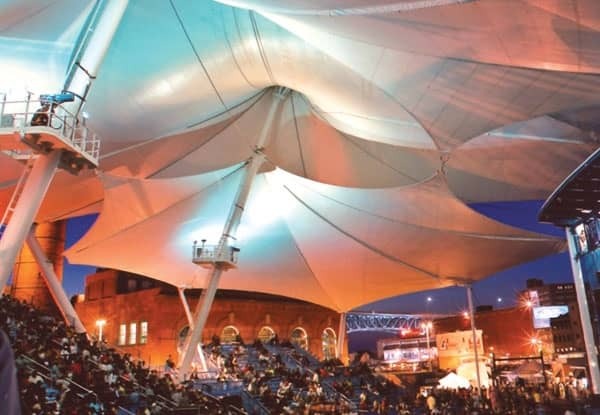 The summer home of the Atlanta Symphony Orchestra, the Verizon Amphitheatre, needed a high-performance, weather-resistance membrane with aesthetic appeal for this unique tension structure. Shelter Rite architectural fabric covers the steel frame and provides the weather-resistant features of the structure. The membrane is a heavy reinforced polyester fabric coated with a weather and sunlight-resistant compound. The compound itself has slight translucent features that allow the facility a wide range of options in lighting and overall facility appearance. Shelter Rite provided the strength and flexibility needed for the construction of the Nautica Stage, while providing a high tolerance for the excessive winds and snow common to this locale. 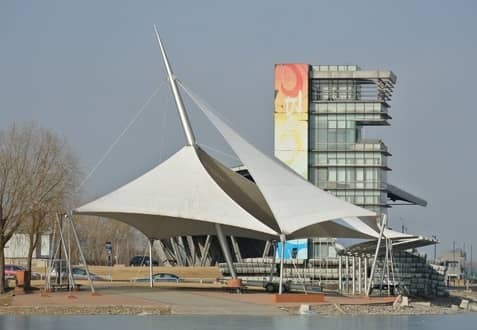 Additionally, a Bright White fluoropolymer finish was applied to the top of the architectural fabric, making it virtually self-cleaning and resistant to the deteriorating effects of UV rays. 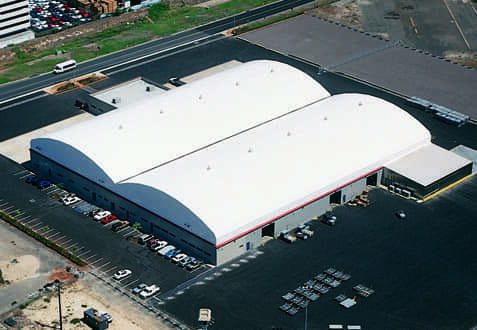 In the end, more than 74,000 square feet of fabric was used for this custom designed tension fabric structure.